Which materials do you work with? I paint with acrylics, and always use the highest quality paints and canvases to ensure durability and maximum light fastness. How long will it take to paint my commission? From your initial enquiry to delivery of your masterpiece usually takes around two months, but I am very happy to work to tighter deadlines as required. Just let me know if you have a deadline in mind and I'll let you know whether I will be able to honour this. Will I see my painting before it's delivered? Yes, absolutely. It’s very important to me that you love your painting, so after we've agreed the design I will email you photos of your painting as it progresses, and ask that if you have any concerns, you raise them at this stage so that the design can be amended accordingly. I will also email you a photo of the finished picture and will only dispatch it once I know you are happy with it. How much will my painting cost? Prices are based on the complexity of the subject and size of the canvas, as these are the factors which determine how much work is involved in any given painting. Prices start from £600 and I always offer a variety of size and price options to help you find the solution which works best for your living space and budget. How do I buy a painting as a gift? If you know what you'd like to commission, we can design the painting together and I can even gift wrap and deliver it directly to the recipient with a hand written message of your choice. Or if you'd like to let them choose their own painting, a gift voucher would be the ideal solution. These are available to buy through my online shop. How do you deliver your paintings? If they're within around an hour of my home in south London, I like to deliver paintings myself so that we can arrange a time that best suits you, and because I love seeing my clients' reactions when they receive their works of art. However for those living a little further away or in another country, I wrap my paintings very carefully and send them by courier so that they're tracked, insured and safely delivered. Delivery within the UK is free of charge. If I order another painting at a later date, can you guarantee that the colour will match my first painting(s)? Unfortunately not. If you would like to match the colours of two or more paintings, I recommend ordering all the paintings together. I will then mix the paints at the same time, ensuring exactly the same colour is used on each canvas. Should I frame my painting? This is very much a matter of personal taste. 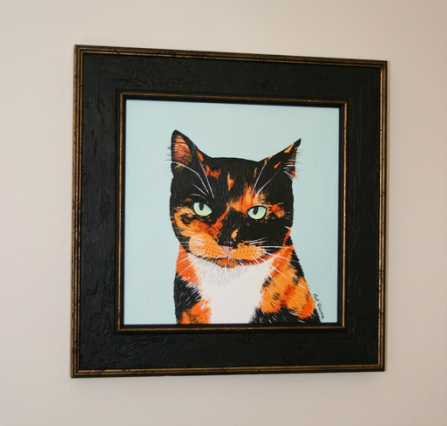 Unframed canvases have a contemporary, clean look whereas frames work well in a more traditional setting. I usually paint on canvases which are stretched over a 4cm thick frame. These look fabulous hung directly onto a wall, or resting on a shelf. If you'd like to frame your painting for added definition, I will paint your picture on a canvas board or a canvas stretched over a thin frame. How much will it cost to ship my painting abroad?